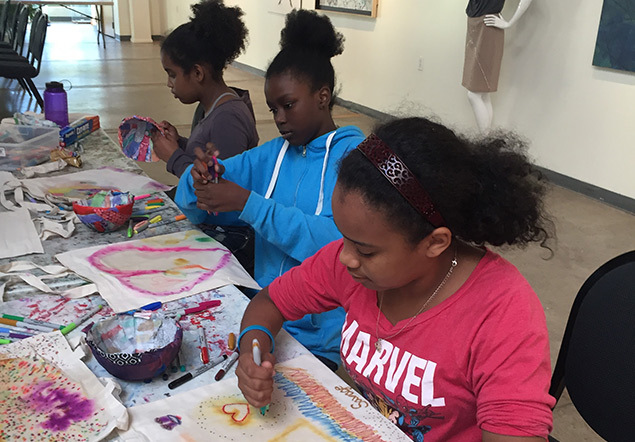 ArtsQuest offers Girl Scout programs that meet requirements for a variety of art badges. All workshops are led by professional Teaching Artists. Girl Scout programs are offered year-round, last approximately two hours, and cost $20/individual. Reservations are accepted based on Teaching Artist availability. All programs are offered at the Banana Factory Arts Center at 25 W. Third St. Bethlehem, PA 18015. Explore the outdoors and use what you see and hear to make different kinds of art projects. When you’ve earned this badge, you’ll know how to look at nature like an artist and make your own outdoor art. Find out how you can make your own art outdoors and have fun doing it. When you’ve earned this badge, you’ll know how to do different kinds of fun art projects outdoors. Learn to paint and color your world. When you’ve earned this badge, you’ll have new ideas about what to paint—and how to paint it. Explore the history of clay art and become a clay artist yourself. When you’ve earned this badge, you’ll be able to make your own projects out of clay. Learn techniques to make your drawings even better. Make your masterpiece—and show it off! When you’ve earned this badge, you’ll know some great drawing techniques. Discover different ways to make jewelry. When you’ve earned this badge, you’ll know how to make different kinds of jewelry. Let nature be your inspiration as you explore, create, and design different kinds of art. When you’ve earned this badge, you will know how to find the art in nature and create your own outdoor artwork. When you’ve earned this badge, you’ll know how to make different kinds of books. This badge comes in a packet that includes the Book Artist, Woodworker, Special Agent, Trailblazing, and Babysitter badges. Find out more about the world of comic art and then tell your own visual story. When you’ve earned this badge, you’ll know how to create your own comic. When you see all the colors and textures of fabrics and yarns, do you dream up a million things to do with them? Get ready to turn those visions into reality as you meet with artists, learn about the world of textile arts, and make two projects in the craft that most inspires you to pick up your needles (or loom or spinning wheel). When I’ve earned this badge, I’ll have learned the basics of a textile art — and I’ll have two fantastic projects to show for it. Bring art and the outdoors together and get inspired by the beauty in nature. When you’ve earned this badge, you’ll have explored nature and created several different kinds of outdoor-themed art.